Bernard Koloski, PhD, is author of Kate Chopin: A Study of the Short Fiction and editor of Approaches to Teaching Chopin's The Awakening as well as other works by and online resources about the author. Koloski, Bernard, editor. The Historian's Awakening: Reading Kate Chopin's Classic Novel as Social and Cultural History. Praeger, 2018. ABC-CLIO, publisher.abc-clio.com/9781440857171. 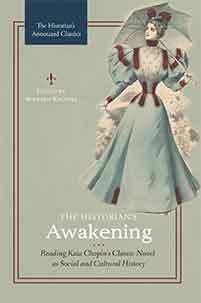 The Historian's Awakening is a full commentary on the text (included) that provides social and cultural history context, discussions of the author and her times as well as valuable insight into historical forces that shaped people's lives.